A completely new modern update to the Turquoise of the Southwest Poster. Designed and Photographed in house using real stones from the Winfield collection. High quality materials and Beautiful life like images create not only an informational display but a gorgeous room piece. This is the current list of turquoise on our printed poster. Love the updated version of the turquoise map! Pretty cool map. Very nicely put together and printed. Definitely worth the $15. This is an excellent resource and map detailing the American turquoise mines, their locations, and the types of turquoise from those areas. I am happy to have it as a guide. It is definitely suitable for framing and the colors of the different turquoise stones are very accurate. I am glad that someone took the time to create (or re-create) this map. It is a great item to have and is a wonderful purchase. Thank you for making it available! We love the new Turquoise map. We put it in our mining museum to share with our customers. I have the older turquoise map, this new one is much nicer. If you love turquoise this is a must have. MATERIAL : 100lb Glossy Paper w/ Aqueous Coating. ​DPI : Full 300 DPI resolution. Stones : In-House photography of each individual stone for actual colors and textures. Stones are from the Winfield Collection. *Item comes with Poster only. No Frame or Lamination included. We realize there may be some mines that we have missed, however we have done our best to collect and photograph as many as possible in our possession. As we gather other samples and new information arrives we may update the poster in the future. The Winfield family has a long history of southwest turquoise. 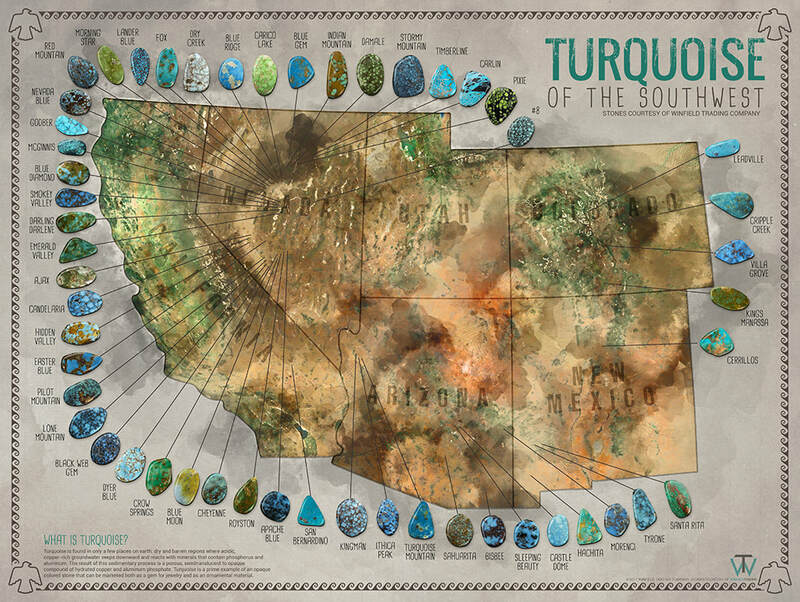 From turquoise mining to Native American jewelry, we have used our expertise, experience and history to create an accurate, yet creative illustration of southwest Turquoise and their mines. Actual turquoise coordinates are not represented and are merely representative of the area/county they are located. Wholesale pricing is available in quantities. If you are a retailer interested in offering our new Turquoise Poster Map, please fill out our wholesale request form.